This week (April 19-25) marks the 63rd anniversary of Administrative Professionals Week and it’s the perfect time to thank your office management team. Without your smart and capable manager, where would you be? Within just the past decade, the role of the dental office manager has taken on a new shape. Today’s office manager is a savvy business professional who helps your practice achieve new levels of patient care, manages personnel, ensures regulatory compliance and much more. As the role of dental office managers has grown, so has their support system. One of the first organizations to rise to meet their needs is AADOM, the American Association of Dental Office Managers. Founded in 2005 by Heather Colicchio, AADOM provides managers with the support and resources they need to not just do their job, but to excel at it. Patterson became a sponsor of AADOM more than eight years ago and today we’re the Diamond Sponsor. One of our partnership goals is to help AADOM reach more dental office managers, including by sponsoring local AADOM chapters and awarding scholarships to AADOM’s annual conference – apply now for a scholarship at pattersonpartners.com! This year, we’re partnering with AADOM to do even more, by giving back to Oral Health America’s (OHA) Smiles Across America campaign. For every new AADOM membership between now and January 31, 2016, Patterson and AADOM will each donate $50 to OHA. 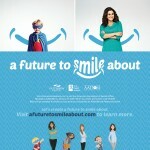 Visit www.afuturetosmileabout.com to learn more about the initiative. While you’re there, why not give the gift of an AADOM annual membership to your dental office manager? It’s the perfect way to say “Thank you” during Administrative Professionals Week!